I can’t remember where I found out about Monument Valley (“adventure of impossible architecture and forgiveness”) but I do know that it has been played a lot in our house since I bought it a week or so ago. Yesterday evening I couldn’t play, or read the ebook I wanted to, because each kid had claimed one of our two iPads. The image is a screenshot from the second “chapter” of MV. The game encourages screenshots. I presume that’s so that people will take and share them; it seems to have worked on me. Princess Ida, in white, needs to step on to the button in the center near the top. Some of the path (the darker part) can be turned using the handle. But that part of the path seems to have risen far above Ida as a result of the last button she stepped on to. What’s a Princess to do in order to get to the next lovely set of puzzles? The base game consists of ten (X) chapters. My favorite is The Box (XIII), which I can’t describe without spoiling. Then Forgotten Shores adds eight (viii) appendices. That’s eighteen (X + viii) levels, each with its own look and theme. While I love MV, I understand that some people prefer longer, tougher games. I don’t understand the people who trashed Forgotten Shores because it cost money ($2). As you journey through the levels you see and inhabit different environments, find new ways of changing those environments, encounter black crows and have the princess in white interact with them in various ways. You may well feel, as I did, that the game-makers want to you overcome the challenges, without making too many of them too easy for you, and that the main reward is entering and experiencing the next environment. 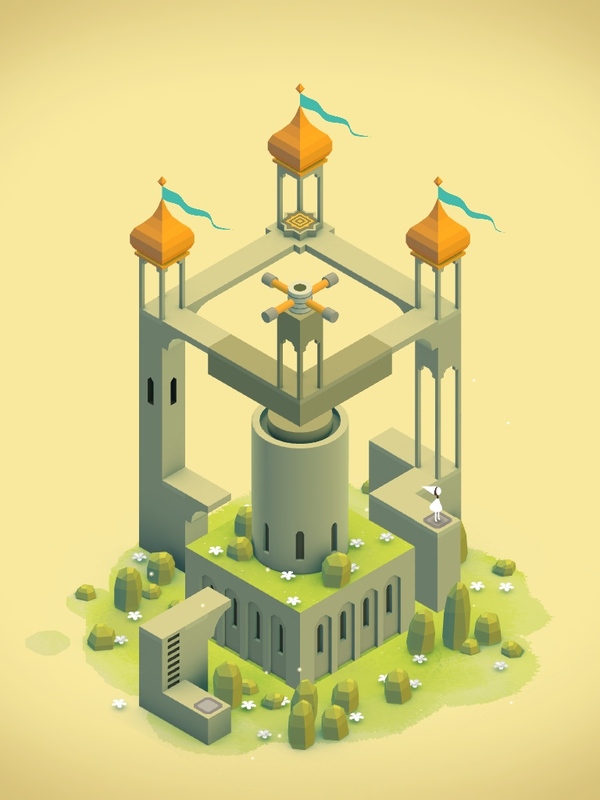 Congratulations on Monument Valley to ustwogames, who recently posted some interesting numbers about the game: sales of over $5M; development costs, substantial but far lower; and so on. Michelle Starr at CNET contrasted Monument Valley’s pricing with the freemium model: I for one am glad that I never saw ads in Monument Valley. At about the same time I was rereading Getting Things Done, I was reading Reality is Broken for the first time. The full title of Jane McGonigal’s book is Reality Is Broken: Why Games Make Us Better and How They Can Change the World. Make us better? Does that mean that games can encourage us to get things done? Yes it does: for example, McGonigal and her husband compete in the game Chore Wars, each an adventurer seeking to outdo the other in tasks such as “conjuring the clothes” (doing the laundry). That raises the question: can Allen’s GTD system be “gamified”? This question has been asked and addressed before (for example, by this fellow WordPress blogger). Next question: has someone already developed a GTD game? The nearest thing I and Google could find was Epic Win, an ioS app that provides a role-playing interface to the familiar to-do list. Here’s the avatar for my character, which has recently leveled up (but only to 2). To address first the question that led me to Epic Win: it’s not a close fit with GTD. For example, EW expects actions/quests to be assigned a date, whereas Allen specifically recommends against the daily to-do list. It would be more GTD-ish for quests to have locations on the EW map, just as GTD actions can be assigned contexts. That said, it would be unfair to judge EW as an implementation of GTD, since it doesn’t claim to be one. So how is it as a to-do list flavored with quests and other role-playing spices? I’d say that the (RPG) spices are done better than the to-do nutrition. I don’t find the interface to be intuitive. Part of this is due to organization by date, rather than by context, priority, or some other criterion my choice. But there are other things I stumble against. There is integration with Google Calendar. But as far as I can see, there is no integration with Google Tasks. More seriously, EW made some strange (with respect to time of day) changes to my calendar. Epic Win feels like a work in progress. To be fair, there is progress, in the form of updates to the app. But, at $2.99, it feels expensive for an iPhone app. Maybe we’re spoiled in terms of app prices, and maybe I’m judging EW as I’m using it, on the iPad, rather than on its native iPhone. So I’m still looking for an iPad app to gamify GTD. Any suggestions? Or any reactions to my remarks on Epic Win? 2012 is a quarter gone already, and I haven’t been posting here much. It seems like a good time for to review the year so far. I’ll do so with a few brief posts. I was going to make this first one a review of technology in 2012 so far, but that could get long, so we’ll focus here on one of the major tech events of Q1: the launch of the iPad 3. Is the iPad 3 so good that it makes an iPad 2 owner yearn for it? I have a particular interest in this question, since I’ve had an iPad 2 for about a year. In March 2011, I posted that the iPad 2 overcame some of my objections to all things Apple. I’ve been very pleased with the iPad 2, as subsequent posts show. Other members of the family have also been pleased with it, although not to the extent that there’s been a lot of tablet-grabbing conflict. Display: twice the pixels per inch (264 vs 132). Most reviewers of the new iPad are very impressed with the difference. I have no problems with the display quality on the iPad 2, so I don’t yearn for this improvement. On the other hand, I haven’t done as much ebook reading as I expected to do on the iPad 2, and it’s possible that I might do more on a new iPad, with its crisper display. 4G rather than 3G, if you have the data plan. I went for Wi-Fi only, to save money on the iPad itself, and to save a lot more money by not paying for a data plan every month, and haven’t had serious regrets. A real (5 megapixel) camera. I suspect that an iPad would feel rather cumbersome and silly as a camera. So far then, I have no envy of people with the iPad 3 (which is actually just called the iPad). But if I were taking the iPad plunge now, I would spend the extra $100 to get the new model, rather than the iPad 2. For Wi-Fi and 16GB, the new one costs $499 – what the iPad 2 cost a a year ago. What do you think? Would I quickly wonder how I lived without an iPad 3, where I to spend some time with one? How will the iPad 4 be different? Unstuck is an iPad app including tools “designed to kick-start success for specific kinds of stuck moments”. 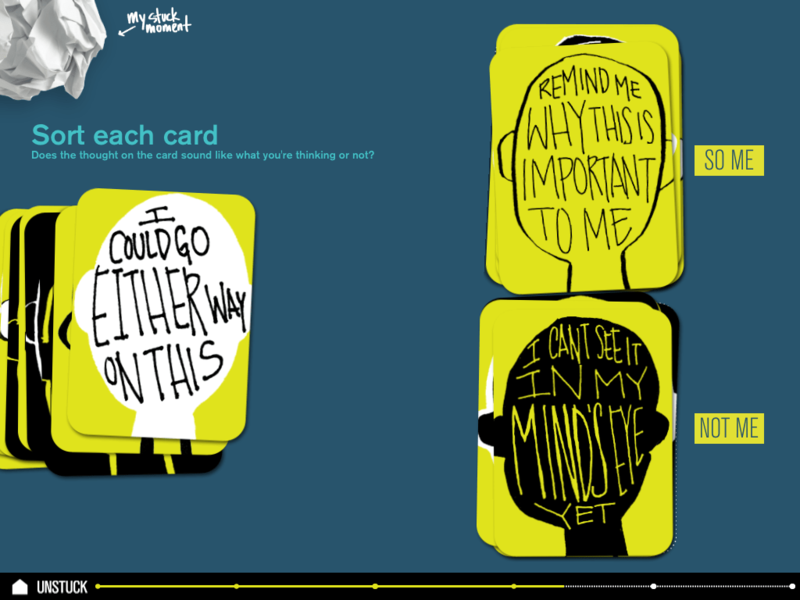 It also includes paths to the appropriate tools, starting by describing your particular “stuck moment”. Unstuck is one of most professional-looking iPad apps I’ve used. Here is one step along the path that leads from description of the stuck moment to unsticking tool. This particular step uses a card-sorting metaphor. Other steps involve more digital-native methods of interaction. I’m not sure I’d agree with the description of Unstuck as “virtual on-the-go life coach” (Leena at TechCrunch), since it’s less general, and more unsticking-specific, than that description suggests. But the app certainly seems well thought out, in terms of both process and presentation. I’ll try to find out more about the decisions behind Unstuck. One set of decisions relates to the process through which the app takes its user. What are the psych and therapy grounds on which it is built? Another set relates to the presentation. Why iPad? Why this particular mix of interaction styles (card-sorting, box-checking, etc.)? Then there’s the obvious question. What if you’re stuck because you can’t resist trying out new iPad apps, web services, etc.? I’ve played a bunch of games on the iPad since getting an iPad 2 earlier this year. Though I’ve enjoyed Angry Birds and other made-for-mobile games, my favorites are actually boardgames implemented on the iPad. I used to play a lot of boardgames before the kids came along. My favorite was, and still is, Through the Desert. In TtD each player establishes and extends camel trains, and earns points for visiting oases and waterholes, for marking off areas of the desert, and for having longer camel trains than other players. TtD presents interesting decisions, while being defined by fairly simple rules. The designer of TtD , Reiner Knizia, is particularly good at simple rules framing interesting decisions. When I got far enough into boardgames to have a favorite designer (a little more than a decade ago), Knizia quickly took that spot, and has retained it ever since. TtD is one of what is sometimes called Knizia’s tile-laying trilogy, which also includes Samurai and Tigris & Euphrates. In each of these two other excellent boardgames, play involves placing cardboard tiles on a board representing a map. TtD could have been implemented using tiles, but I’m glad to say that it includes little pastel-colored plastic camels. Each of the games in the trilogy now has an iPad implementation. I want to get on with discussing these apps, so I’ll refer you to BoardGameGeek for further detail of the games themselves. There is a lot of information and opinion on these (and may other) games at BGG. So, for each game, I’ll link to the main page for the boardgame and to a recent review of the iPad implementation; I’ll also provide the current price and a link in case you want to purchase. Here are those links for TtD (main, review, $2.99), Samurai (main, review, $4.99), and T&E (main, review, $5.99). The most important point about the iPad implementations of the tile-laying trilogy is that each of the three iPad apps is well worth buying. Other similarities also deserve mention. Each app allows between two and four players, and each game scales well within this range. (The TtD boardgame takes five players, but I don’t think it takes five well, so I don’t regard the four-player limit as a problem with the app.) Each app allows play against other people, by either passing the iPad, or playing online. 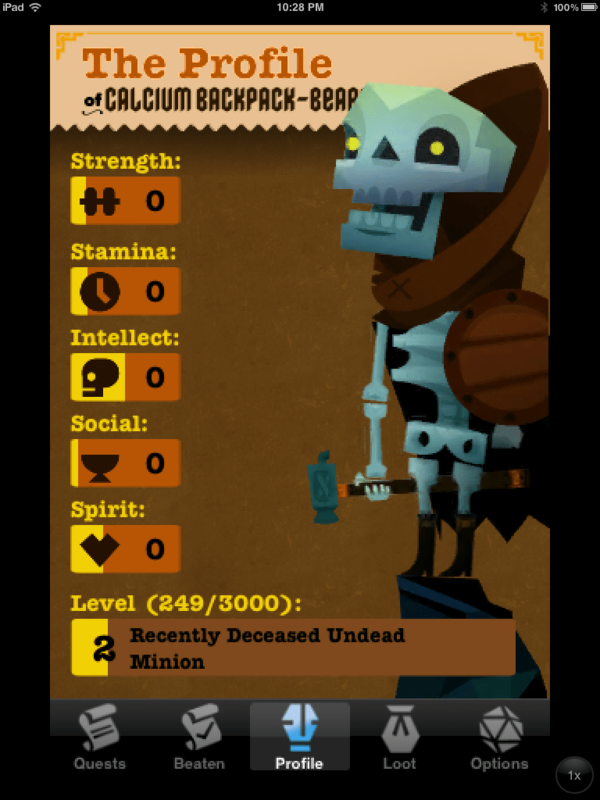 Each app has an AI component to provide one or more opponents. Most of my plays have been against two AI opponents. I’d describe the AI for each app as respectable, but not strong. Each app has a tutorial, so you don’t need to have played the boardgame to use the app. Indeed, the app may well be a good means of learning or trying out the boardgame. Talking of trying out, none of the apps has a free version for you to try before you buy. Enough, for now, of the similarities between the apps; it’s time for the differences, and especially the differences that might steer you toward a particular one of the three apps. Through the Desert is the cheapest app, and the simplest game to learn. As I noted above, it’s my favorite boardgame. On the other hand, it may not be the strongest app of the three. When I first bought the game, back in April, it would sometimes crash during a game, and forget the game state. The current version brought “iPad 2 stability fixes,” which are working for me (as well as faster AI). Samurai has the best user interface of the three apps. I don’t think I have a better-looking app on my iPad. More important, I find playing the app smooth and intuitive. 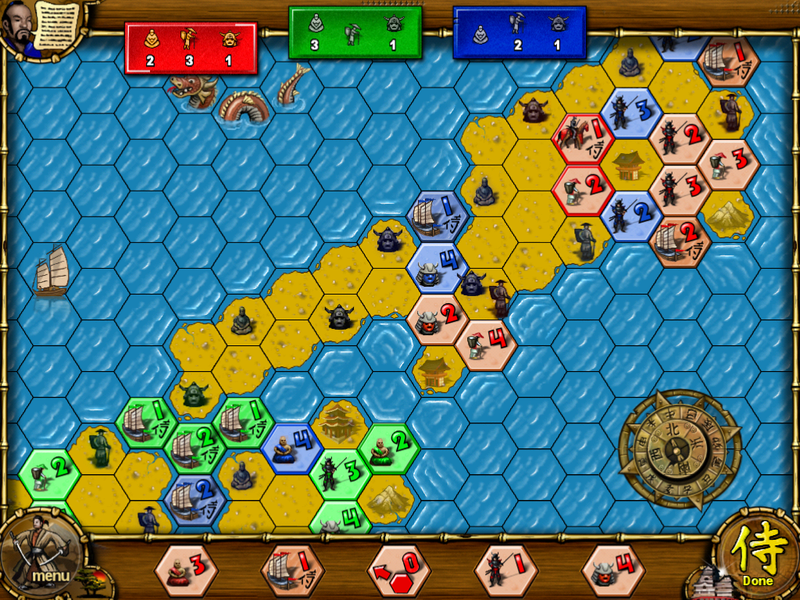 The screenshot shows a game in progress: I’m red, it’s my turn, and I am choosing from the five tiles displayed at the bottom of the screen. If I had make a straightforward recommendation for just one of these three apps, it would be Samurai. Tigris & Euphrates is widely regarded as Knizia’s masterpiece. It is probably the deepest of the trilogy. It certainly has the most complex rules. For this reason, I’d hesitate to recommend the app as a means of learning T&E. So, based on my play, on the iPad, against the apps’ AI, I recommend these three iPad apps, and of course have made more specific recommendations above. I haven’t played any of the games on an iPhone, or online; so if you’re particularly interested in those features, you might want to check out the reviews (see above links) and discussion of the games at BGG and elsewhere. Please feel free to leave a comment here if you have used the features I haven’t, or have anything else to add about these apps, or about boardgames as apps. I’ve just upgraded the iPad 2 to iOS5 (actually 5.0.1). It was silly and straightforward at the same time. In some ways, the silliest thing was having to use iTunes on a “real computer” in order to upgrade the iPad. That said, one of the main improvements in iOS5 is that further upgrades can be carried out over the air from the internet, rather than through a cable from a computer. iOS5 is the iCloud release. Let’s find out about iCloud with a Google search. The second result tells us that it’s cloud service done right. The first tells us that it doesn’t support the Chrome browser. Then I try it, and iCloud does seem to work on Chrome. This all reinforces my view of Planet Apple as a strange place that thinks I ought to move there, do things the way things are done there, and forget about other planets. But some of the ways of other planets are familiar (e.g., planet Microsoft and the Windows continent) or appealing (e.g., planet Google and the Android moon) to me. The Apple abides, as I stated in the post title I came up with last night. It occurs to me this morning that Alice in Wonderland might provide an even better cultural reference than The Big Lebowski. The cat – Steve Jobs – is dead, long live the grin – a rather smug one. While there seem to be some big splashes in online music services (see the previous post, about Spotify and Facebook), much of it is caused by treading water. Meanwhile, there’s significant movement in eBooks. The current big story is Pottermore.com. JK Rowling’s new site will offer many things, including, at last, Harry Potter ebooks. Such is the e-book-business impact that the Wall Street Journal has been very Pottermore-y of late (example). Sam Jordinson in the Guardian hailed Rowling’s marketing genius. Pottermore.com has allowed Rowling to neatly sidestep the middle man (Amazon), maintain complete control over pricing, scoop up nearly all the profits from royalties, and keep all the sales information and the further marketing opportunities that offers to herself. She will also more than likely do all of that at a price and quality that will leave her customers almost as delighted as her publishers (who remain on board) and her accountants. Part of the reason is that I’ve only recently embarked on ebooks myself, having had thoughts and doubts about ebooks for some time. What’s changed is that I now have an ebook-friendly device: an iPad. The first full-length ebook I bought was Ian McDonald’s The Dervish House. I bought it at Amazon, when it was on sale for a couple of bucks. So I am using the Kindle application on the iPad, and it’s going pretty well so far. I can’t bring myself to pay as much for an ebook as for the corresponding physical book. That may well change with time, and would be different if the ebook had worthwhile extras. I don’t expect to be among the many who buy ebooks at Pottermore, although I’m sure I expect I’ll give the site a try. WordPress provides an app for those blogging with iPads, and a familiar face for those browsing with iPads. The face is actually a plugin and theme developed by Onswipe, and built into WordPress.com. My plan was to get a screenshot of this blog with its Onswipe face on, then to include that shot in a post written using the app. This is that post. Getting a screenshot on an iPad is easy, which is as it should be,and a refreshing contrast with getting an Android screenshot. Getting the screenshot from the iPad into this post was easy, once I realized that the app hides the photo icon under the onscreen keyboard. I don’t see an easy way of including links while posting from the app, though. I’m editing the post now, a day later, on Windows, because including the links wasn’t easy using the iPad browser either. As for the Onswipe theme, I think it would fit better with a blog that had an image for every post. The current post’s image shows that this isn’t such a blog. Although I am a loyal and longtime WordPress user, and have enjoyed my first two weeks of iPad ownership very much, I am not blown away by the combination of iPad and WordPress. I refer to my own experience of the app and of Onswipe. 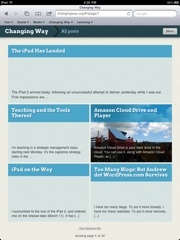 There are of course other ways in which iPad and WordPress go together, and many other people who use both. If you are one of those other people, I’d be interested in your comment. The iPad 2 arrived today, following an unsuccessful attempt to deliver yesterday while I was out. First impressions are that it’s cool but entitled. Of course you need iTunes. Of course you want to give me your credit card number, phone number, etc.